The contemporary artist Sabrina Raaf has created a work that is intertwined with another environmental aspect: the breath of viewers in the room. Translator II: Grower, is a small aluminum robotic vehicle that slowly navigates the periphery of a room hugging the walls while sniffing every few seconds for the carbon dioxide (CO2) levels in the air. 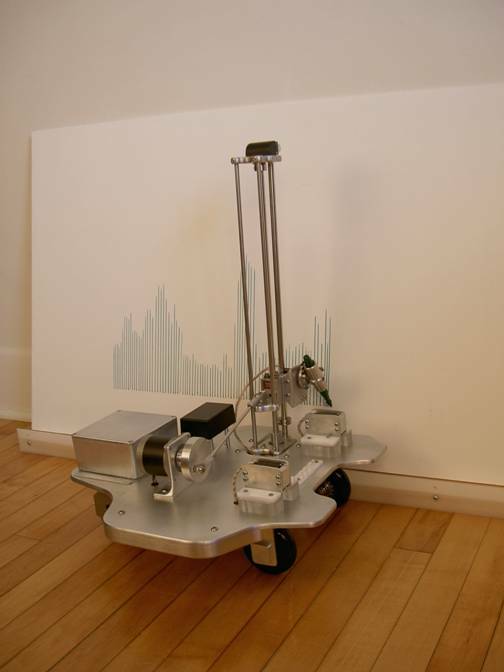 The carbon dioxide is proportional to the number of people in the room, and this induces the robot to draw varying heights of “grasses” on the walls in green ink. When Grower completes a line, it advances along the wall a quarter of an inch and then stops to take another sniff. At the end of the exhibition, the walls are covered with green lines that resemble a field of grass, and the installation becomes a map of the number of participants (breath) in the installations. This design uses four Swanson sensors, which are short-range (one foot) active infrared sensors, around each bowl and is integrated with a BS2 that allows the fish to move forward and backward and turn the bowls. The work also uses the exact DC gearhead motor you will be using in this lab, along with the same H-bridge motor control. 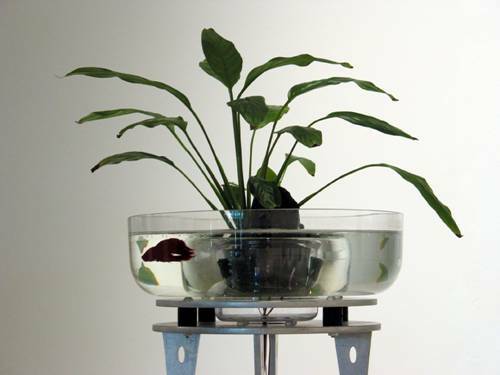 By swimming to the edge of the bowl, the fish activate motorized wheels that move the robots in that direction. Micro video cameras are located within two of the tanks and project on the walls of the installation the fishes’ point of view. Augmented Fish Reality by Ken Rinaldo. 2004. Photo by Ars Electronica Otto Saxinger. From the most recent research of fish intelligence in a publication Fish and Fisheries journal written by biologists at the Universities of Edinburgh, St Andrews and Leeds edited by Culum Brown at the University of Edinburgh. The conclusion is that there are now revisions about fish intelligence, which is much greater than formerly thought, are discussed. Fish are now regarded as “steeped in social intelligence” and, the report says, “pursuing Machiavellian strategies of manipulation, punishment and reconciliation” while also displaying ‘cultural’ traditions and co-operating to watch for predators and obtain food. 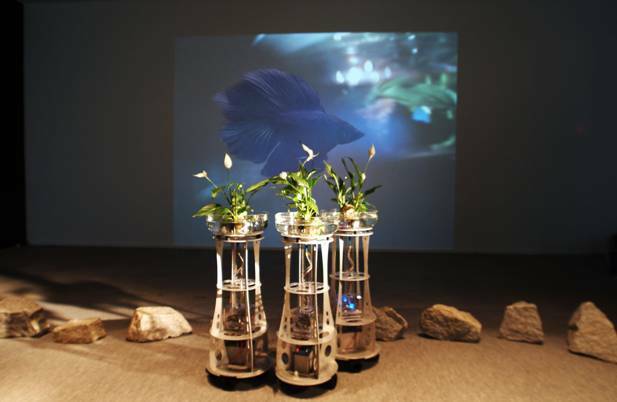 Augmented Fish Reality by Ken Rinaldo. 2004. A close up of Siamese Fighting fish. It is said that fish monitor the social prestige of other fish and track the relationships of other fish in their environment. It is now widely supported that fish use tools and build nests as well as exhibit “impressive long-term memories.” Fish have the ability to mentally map their environments (called a cognitive map) to find food, create relationships with each other, and avoid predators. In speculating what makes a robot conscious, the researchers at the Humanoid Robotics Laboratory (HRL) work on the creation of artificial humanoid machines, but with a twist. Researchers and engineers at the HRL believe that they have narrowed the gap between the ideal autonomous robots envisioned by science as it is modeled by human beings. 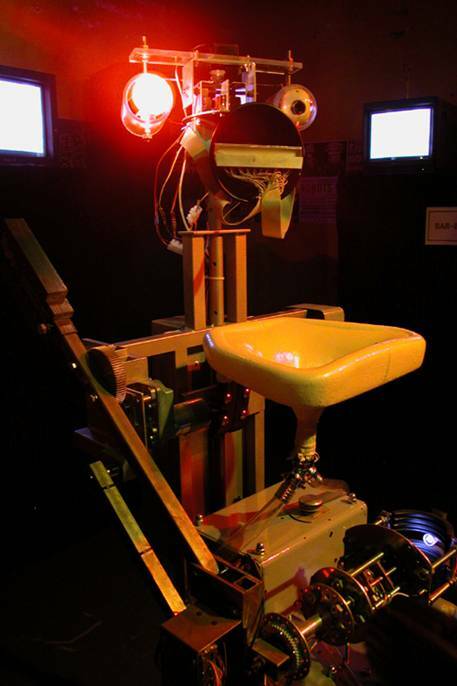 Their robot manifests a behavior we normally associate with humans: the desire for inebriation. The Bar Bot is designed to survive in a bar by asking people for money in order to buy itself a beer. Barbot by Humanoid Robotics Laboratory. 2003. When you approach the work, machine vision tracks your gaze and activates a voice synthesizer that asks you to buy it a beer. A custom micro control system with limit switches senses the weight of the beer in the robot’s hand, slowly lifts the beer, and pours it into its gullet. While robotics science attempts to build robots as human-like as possible, the science tends to overlook a distinguishing human characteristic: selfishness and the pursuit of self-interest. HRL has engineered selfishness into the Bar Bot, as its only goal is to satisfy its thirst for more beer, and therefore, it may be the most humanoid robot ever built. Burp! In the next lessons, you will first learn to solder wire. Then, you can proceed to solder an H-bridge motor control board and complete this lesson by programming your board to control a single DC gearhead motor.